I just got interested in early telephones pretty recently when I picked up what proved to be an AE model 1A at an antique store, in fine condition. Unfortunately it didn't come with a ringer box. I got an AE ringer box, but I suspect based on my research since then that it's not the correct one for this particular model. Anyone know the exact original ringer box for it? But anyway, if I can get these two to work together I'll call it good for the moment. Can anyone help me figure this out? From what I've seen on the forums I thought I understood how to connect the ringer box to the wall, with replica cords I got, but I just get a busy signal when I connect it (admittedly without the phone) to the wall and then call myself. And I don't know how to connect the phone to the ringer box; the diagrams I've seen seem to suggest four cords are needed and the replica cord I got only has three. And I haven't seen a diagram of where to attach them in the ringer box. I can't tell for certain but I think that is just a ringer box, not a subset. You need a subset which will have a ringer as well as an induction coil in it. AE made a full subset as well as a ringer only in that type of box. The coil would be mounted directly under the terminal strip in the box you have if it is actually a full subset. That style of box/subset would be appropriate for an AE 1A phone if it is a full subset. Welcome to the Classic Rotary Forum by the way! Welcome to the CRPF. You have , what looks like, the 4 leaf hookswitch version of this phone. The 32 Compact Type subset is what my catalog said to use with it. As Terry stated , you need to have the induction coil in the subset. Thanks a lot! I don't know much yet about all these things or how these work, how to test components, et cetera. What would an AE induction coil of that era look like? Is there a book I should read that would help? Stub, it says you're a "Hero Member" and you sure are. Thanks a million! If I manage to find a 32 ringer box I'll try to post actual photos. I assume the one I have is the standard size, which with your information gives me an idea of the compact's size. Is eBay, where my ringer box came from, the best place to move it along? Since it's not correct for this phone I might as well. From the outside they look the same. You need to see pictures of the inside to know what it is for sure. First picture is the AE 32 Ringer (Only). Second, Third & Forth pictures are the AE 32 Complete Subset. 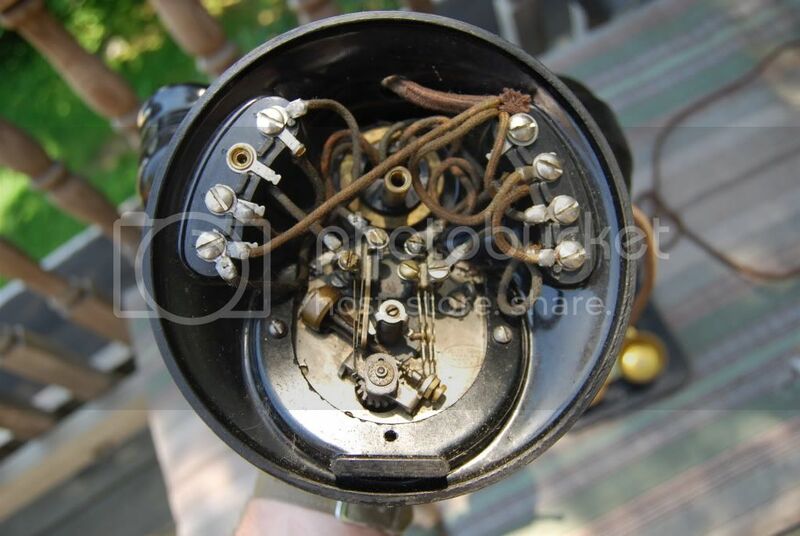 The pictures that I have posted of the complete subset have the older style ringer and Induction Coil in them where as many out there will have the newer (smaller) ringer in them like my first picture and your ringer. Older type ringer or new ringer makes no difference. Keep in mind though that many of these subsets and ringer boxes may not have SL (Straight Line) ringers in them but will have frequency ringers for party lines in them so you might get a subset that won't ring! Look for the "SL" marked on the ringer. Thanks, Terry. Any recommendations on where I might look for one, besides eBay? Sorry but I still haven't mailed you the 32 subset. I got worried that I still wasn't sending you the exact subset that you need as there seem to be many variations. I contacted Stub who looked through some of his catalogs and confirmed that there are variations so we need to look at this closer but I haven't had the time this past week. I think the subset that I posted pictures of above is the exact one I was planning on sending to you. I think that the drawing in it indicated a 4 conductor cord was needed. How many leads are there in your cord from phone to subset? Stub: What version of 1A do you think Matt has? I think that it is important here to check whether or not the handset has the buikt-in inductor coil. The subset will depend on that. I don't think that it would need a subset if it had the built in induction coil unless you wanted a ringer box with it. But I think there may be sidetone or antisidetone versions. Stub scanned a bunch of catalog info and emailed it to me (thanks again Ken!) but I haven't had time to really go through it all yet. Maybe I'll try to post a bucnh of it into this discussion. It would still need a condenser which I would expect would be in the subset. There are 3 cords in the cord that I got for phone-to-subset, and four in the subset-to-wall, though according to another thread here you only need two for that connection-- the others are redundant. You're probably right about the other, though-- I probably need a four-line cord for phone-to-subset. Don't know where to get it, though. A quick fix, and only temporary if you wanted to find original cords later, would be to use the 4 conductor line cord, which looks like Silver Satin line cord, between the desk set and the subset and the 3 conductor (looks like cloth) as the line cord. 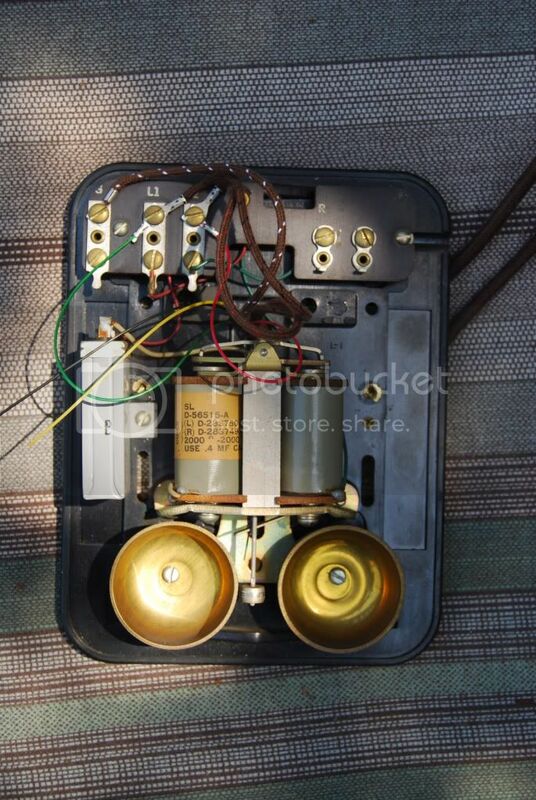 or other places that sell old telephone stuff.